So, week one is past. Fairly successful in my plant based diet efforts. 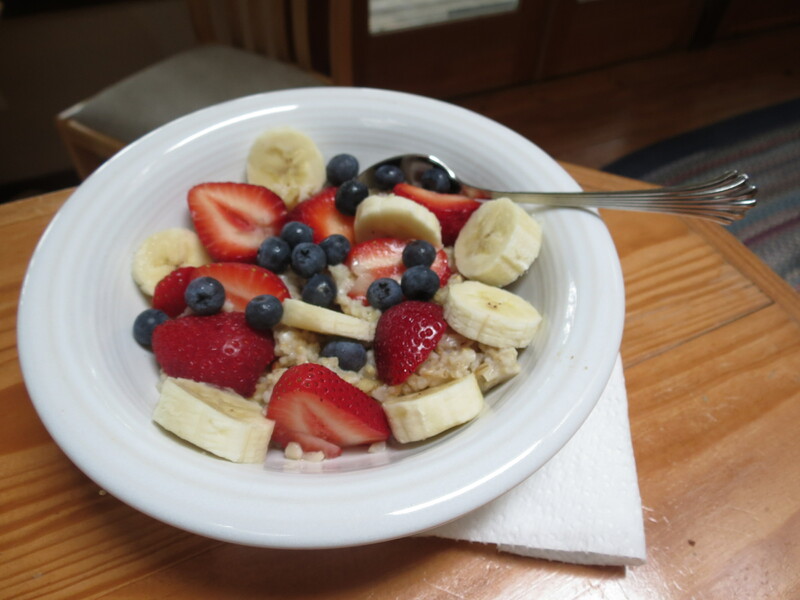 Three mornings with no breakfast; I usually get up and go straight to work, so I am making efforts to give myself more time for a healthy start in the mornings. Orange juice, oatmeal with fruit and nuts, or just fruit – mango, strawberry, and blueberry. Lunch during the workday is usually with coworkers , other attorneys or by myself. Most restaurants are a vegan challenge. Pick & choose, or combine multiple small plates of greens, beans, grains, etc. Went to a steakhouse with Nina [Urban Vegan Chic], but had a vegetable quinoa bowl and vegetable empanadas. Very good! Had a lunch of sushi – noncompliant but good. Avoided the temptation of pulled pork & kielbasa sausage, despite the wonderful smell. Eat hummus and pita a lot – good snack! 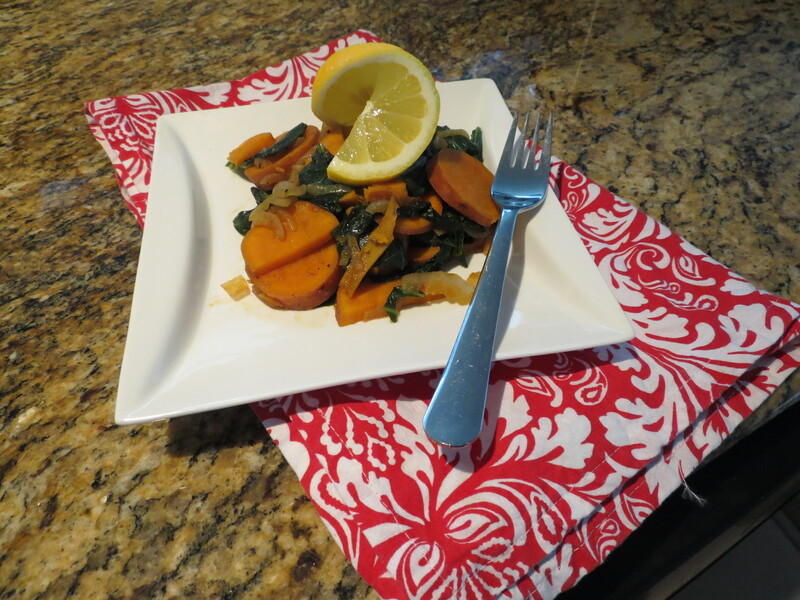 Nina has made wonderful evening meals: Yams, onions, garlic & collards. All the plant based diet foods fills you up. Not been hungry! My friend made it through week one. Yay! No, it wasn’t 100% vegan, but it was fairly close! I urge you all to be encouraging when a friend or relative, who has been on a Standard American Diet (SAD), tries to go plant-based! Remembering that we too were once meat eaters, unless we were among the one percent lucky ones who grew up in a vegan household. Again, I urge you to be supportive and not overly critical. Not everyone can do this! Our society is not well set up for encouraging this type of change and people who go vegan are sometimes ridiculed or scorned, so let’s not fall in under that category, even when someone’s efforts aren’t “perfect” or 100 percent! The question then beckons, “Are you perfect 100% of the time?” I’m certainly not, but I do give healthy eating my best efforts most of the time! Thank you, Helene! He certainly is off to a great start! He’s in a high pressured job. Works a ton of hours and sometimes has little to no time to eat, so grabbing “something” is sometimes easier. On Friday he had had nothing to eat until dinner. I said, “At least, eat a banana!” (We had a “talk” about that one!) You’re right, it is becoming more and more common…and thank goodness! People are becoming much more accepting of those of us who are vegans!